PEPLUM TV: Kirk Morris - stuntman in SAMSON & THE MIGHTY CHALLENGE? Kirk Morris - stuntman in SAMSON & THE MIGHTY CHALLENGE? A new DVD of SAMSON & THE MIGHTY CHALLENGE (1964) was released in France. The image is very clear, so much so that we see details we weren't supposed to see, like the stuntman standing in for Alan Steel, who played Hercules. The stuntman looks more like Kirk Morris than Steel. In fact, I'd swear the stuntman was Kirk Morris. The only thing which tells me that's not Kirk is the stuntman is not as muscular as him. But he's an almost exact copy of Kirk from HERCULES, SAMSON & ULYSSES (1963). Both Morris and Steel worked as stuntmen during their career. It's odd to see a stuntman in lieu of Steel in these action scenes. The three following screenshots show the stuntman in action. 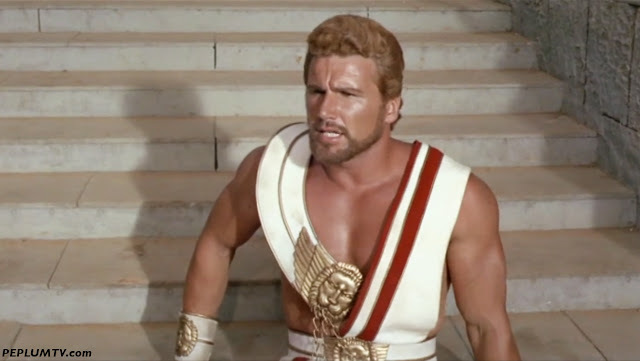 Above: Kirk Morris in HERCULES, SAMSON & ULYSSES (1963). The stuntman in the 3 screenshots above look more like him than Alan Steel in the movie (below). I posted about the French DVD of this yesterday at your Poster of the Week entry. Actually the DVD of Samson and the Mighty Challenge has been out for about a year. The other two titles, Hercules and the Sons of the Sun and Hercules the Invincible, are more recent releases. All of them are of superior quality and well worth getting.